I looked at this photograph and thought, “That’s odd. Two competing radio stations from two competing newspapers from two competing cities used the same radio transmitter. How did that happen?” And then I read about the extremely unusual time-sharing arrangement that WFAA (which was owned by The Dallas Morning News) and WBAP (which was owned by The Fort Worth Star-Telegram) maintained for 41 years. The two frequencies were 570 and 800 (later 820) kilohertz on the AM band. When WFAA was broadcasting on 570, WBAP was broadcasting on 820. On the agreed-upon time, the stations would switch over to the other frequency. Back and forth. Over and over and over. All day long. They were independent stations with independent programming, network affiliations, on-air talent, and advertising departments. And this went on for FORTY-ONE YEARS! Until 1970! How had I never heard of this? Apparently it wasn’t all that big a deal to the stations or the listeners. Things were getting a little strained by 1969, though, when WBAP went whole-hog into playing country music (and eventually became one of the most successful country stations in the United States). It was time to go their own ways. The split was amicable, and both stations felt that the unusual partnership had worked well for all concerned. So why did this happen in the first place? Because of the 820 frequency. 820 was a clear channel frequency, which meant that the station that owned it could broadcast at an incredible 50,000 watts — enough to be heard all over the Western hemisphere; 570 boasted a measly 5,000 watts, and, as someone said, “people might hear you in Sherman … but maybe not.” Neither WFAA or WBAP wanted to give up the clear channel powerhouse, which is why their piggy-backing partnership lasted as long as it did. But, ultimately, WBAP got 820 and was a major broadcasting force to be reckoned with. WFAA radio got the short end of the stick and sputtered along at 570 on the AM dial for a few lackluster years but never recovered from losing its half-share of 820 AM. In the WFAA-WBAP showdown: Fort Worth 1, Dallas 0. 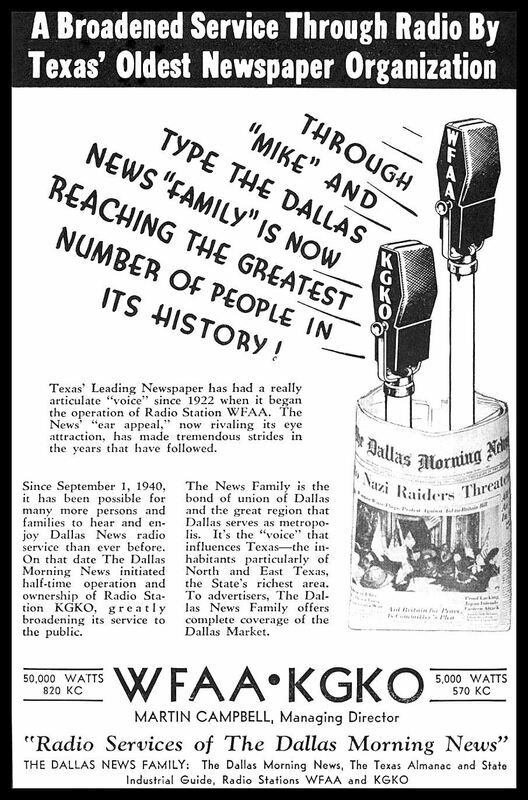 Sample schedule is from the definitive article on this bizarre broadcasting alliance: “You Have Half a Station, We Have Half a Station” — How WFAA in Dallas and WBAP in Fort Worth Shared Radio Frequencies for Four Decades by John Mark Dempsey, from the Spring, 1999 issue of Legacies magazine, which can and SHOULD be read, here. 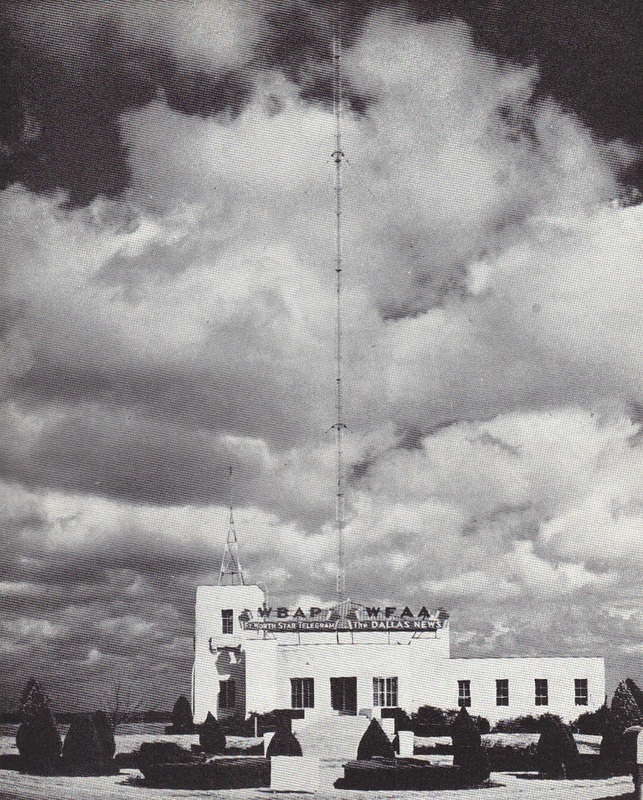 For another photo of this transmitter building, see a previous post here. For an explanation of why the clear channel frequency of WFAA/WBAP switched from AM 800 to AM 820 check out the Wikipedia article entitled North American Radio Broadcasting Agreement. That one’s pretty curious too.